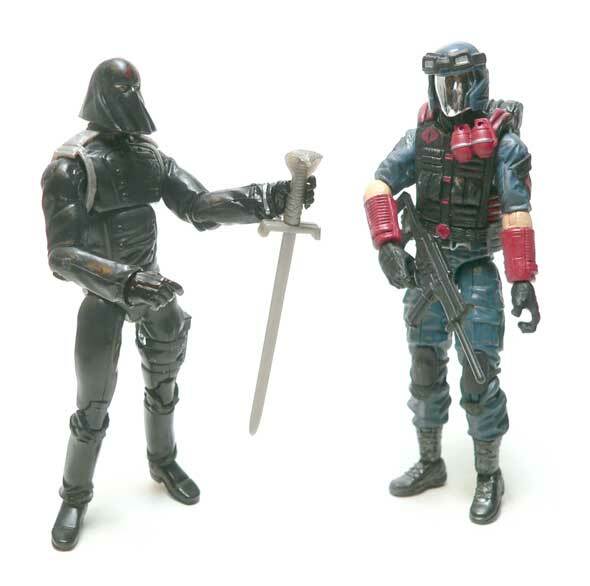 I’ve documented how I no longer have my vintage mail away Cobra Commander. So it’s no surprise this black suited CC that was part of the Dollar General series appealed to me. 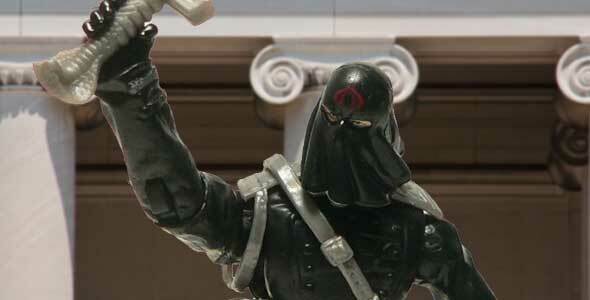 I’ve always seen the hooded version of Cobra Commander as a more ceremonial version. He’s not going to wear that hood just anywhere. The black here suits that idea. The head is pretty much a classic look for CC. You get the sense he ain’t smiling under there. The mask is sculpted so that it looks like it’s being swept by the wind. From the front, it looks pretty good. From the side, it looks slightly wide. Of course, I don’t know many folks that wear a hood, so I don’t have a real world reference. 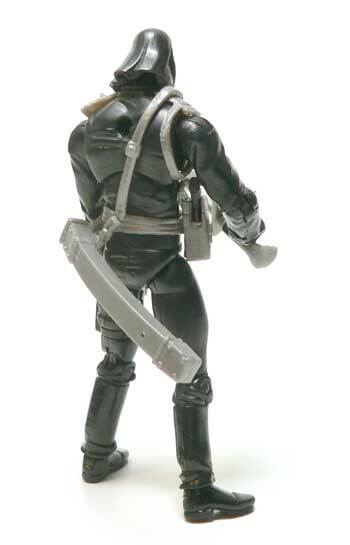 The head also has the lone Cobra logo for this figure. It looks ok, but I think it could be just a tad brighter for a bit more contrast. I’m guessing his body is based on a Crimson Guard. The double button chest flap makes me think that. Also, the chest has insignia on the the left breast. Considering the figure is all black, a little paint here would have helped. Obviously, he wouldn’t wear black insignia on a black uniform. A little silver to match the detail on the cuffs would work well. There is silver in his web gear. The overall piece is molded in silver with a splash of red for the buckle. Unfortunately, there is a huge sheath and holster attached to the webbing. Considering how good some of the holsters have looked lately, this is a bit frustrating. While I understand chest straps like this have been part of a number of historical uniforms, I really would have preferred to see it as sculpted element. The sheath is bent from being in the blister. I’m sure a little hot water bath could help it quite a bit. The top flap on the holster would probably benefit from this as well. I suspect this is not the gun originally intended for this holster. In the package, I thought the right shoulder braid and shoulder boards were part of the web gear. Turns out, they’re not. They are separate pieces molded in silver plastic inserted into the shoulders. I have to say I like the way this makes the braid look. It looks better than anything that could be sculpted flat to the body. The legs of this figure remind me a bit of Jedi Luke legs. If it wasn’t for the screws and different style of hips, I’d guess they would’ve been reused from there. Taking off the web gear, you are left with a pretty basic figure. The black uniform really looks fairly good. Yes, I always think of Cobra Commander in blue. But I have to say the black suits him. If you had a thrown room display, this would be a pretty nice figure to have for it. 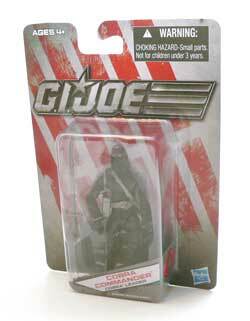 He has the classic Cobra Commander look, but without all of the battle trappings. This Commander has the pomp that you would expect in a secret ceremony or high level meeting. One thing that kind of looks odd, is the cuffs and lower arms appear to be from a coat where his chest looks more like a uniform top. Now, I just happened to have a couple of coats I could think of that might suit the purpose for CC. The first being the obvious one from the Doctor Rex figure. 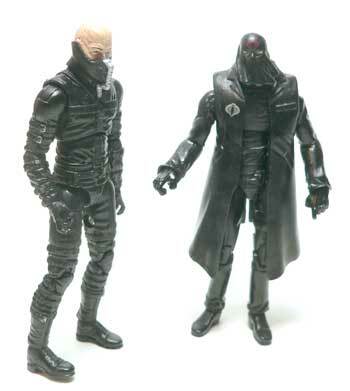 That coat, molded in black has a silver Cobra logo on the right breast. The coat looks okay. However, the shoulder boards push it up a bit too far. I’ve seen worse figures for sale on the pegs, for sure. If you really liked this look, you could try to pry out the shoulder pieces. The coat would probably set down then. The other coat I was thinking of for him was a trench coat. 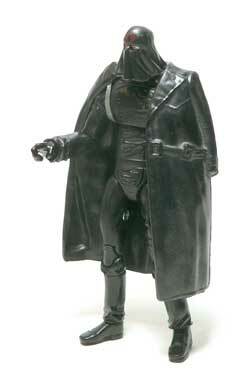 Again, molded in black, I thought the trench coat from the vintage Toht figure from the Indiana Jones line might look cool. It fits about as well as it does on Toht. Again, it would probably better with the shoulder pieces removed. Of course, the Commander has to have some weapons. In this this case he comes with two. The first is a small pistol for the the holster. Not a typical pistol, it has a round barrel like a target or competition pistol. A Ruger maybe? It’s molded in black, and is okay enough. Doesn’t seem ornate enough to me for this particular CC. The second weapon is a Cobra sword. The hilt is sculpted in the shape of a cobra. This is the ornate weapon I would expect a ceremonial CC to carry. I doubt it would be practical for actual fighting, but there are a fair number of ceremonial swords in the world. I was actually surprised to find the Dollar General figures came with stands. I really expected that to be a cost that would be cut from them. The stand is a generic Cobra logo stand. The nice thing for customizers is there is no writing on them. I actually kind of like that look. Out of all the Dollar General figures, this is the one I’ve heard the least amount of buzz about. While probably not the stand out figure of the wave, he’s better than people give him credit for. 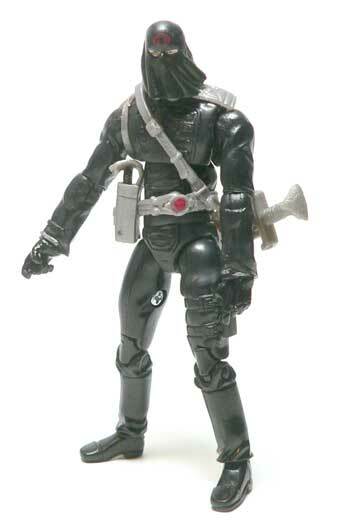 Yes, you can only need so many Cobra Commanders, but this isn’t a bad one to have. A little custom paint could take this figure up a notch. However, taking the price of these figures into consideration, I really don’t have complaints. 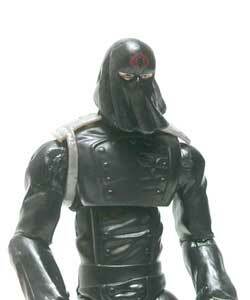 And I finally have a hooded Cobra Commander back in my collection. Really nice figure. A bit too monochromatic maybe, but as you say, black sits well with this sculpt of CC. Great review, I too like formal shall we say “black tie” outfit, also agree that just a little paint could take this figure a looooong way.